Recently I came across an article in the newspapers which talked about the vivid changes that have occurred in the way festivals are celebrated. Households have become units of consumption as opposed to units of production like how it was in the good old days! These thoughts kept me wondering and took me back down memory lane, rewinding my life to many years ago when I was still a little girl. I saw my grandmothers prepare tins and tins of snacks and sweets for festivals, prepared with love and affection for family, friends and those who came visiting during the celebrations. Most of the houses I visited or came across during this visit had sweets bought from outside. I have nothing against this and I relished many of those sweets and I, myself order sweets at times when they have to be distributed in large quantities. But, I do feel that there is something amiss in this process. By not making anything with one’s own hands, there is a loss of tradition, customs and most importantly a loss of personal touch. When you make somehting with your own hands there is so much going in it, your feelings, emotions, love and at the end of it a deep sense of satisfaction and gratitude of accomplishment which I wouldnt trade for the best gifts in the world. That article also went on to describe how the sweet shops selling traditional Indian sweets are no longer doing their usual rip roaring business during Diwali with chocolate eating into a major chunk of their business. Sorry for sounding opinionated but while I do love chocolates I much prefer my kaju kathlis and burfees for this traditional festival. Festivals for me have a deep rooted significance and embody traditions and customs passed down through generations. As much as I embrace change, I like to cling to ancient rituals of which food is the most prominent. I made these dry fruit burfees on the eve of Diwali and with good intentions to post it on the eve of the festival. But as we proceeded to Bangalore to celebrate Diwali with family, the festivities and a wedding in the family came in the way of best laid plans. The consolation for me here is that Hari had a great Diwali replete with all the ceremonies, pujas, arathi and oil bath, crackers, sweets, new clothes, family and friends. 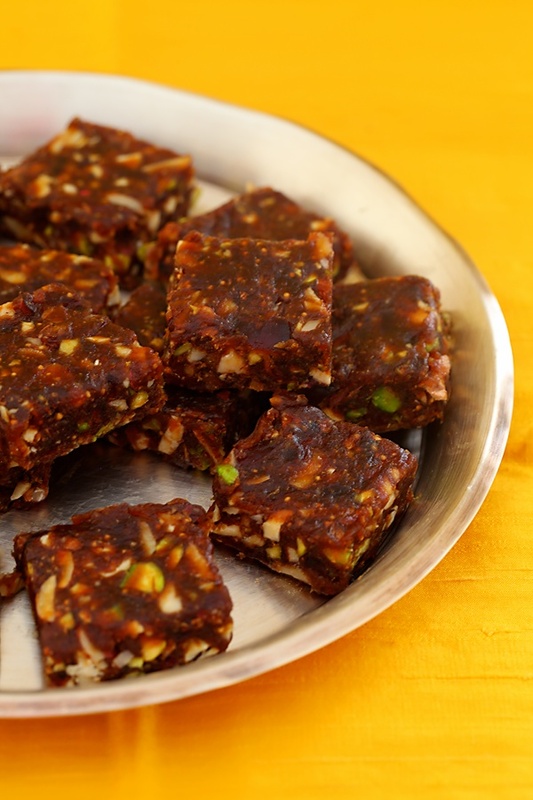 I love to munch on dry fruits and this burfi gives me the goodness of those fruits coupled with the satisfaction of eating a sweetmeat. Being sugar free makes this a guilt free indulgence for those of you who watch sugar in your diet. This also makes a wholesome treat for kids. When my husband took a bite, he closed his eyes and tod me that this tasted so pure, natural and refershing! With the softness of figs and dates, the bite of pistachios and cashews and the subtle flavour of cardamom this elegant burfee has made its way into my heart and I hope it makes inroads into yours too! 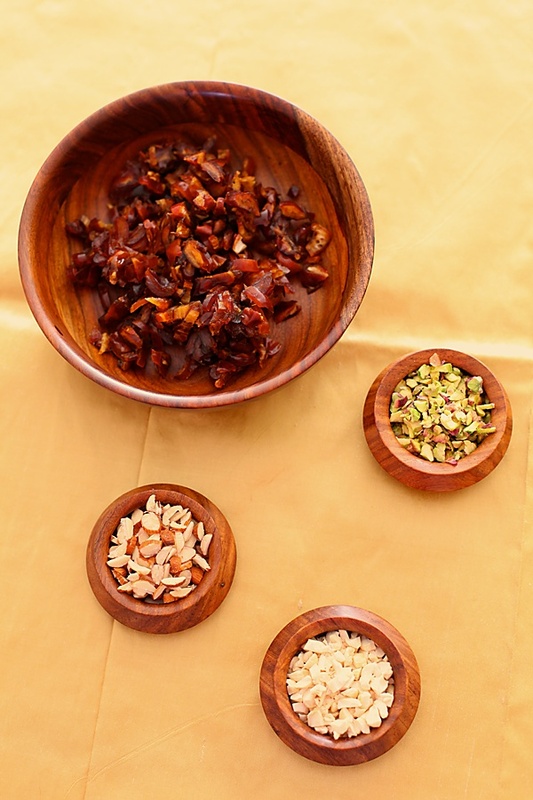 You can use mix in other dry fruits like raisins, cranberries, walnuts or apricots, keeping the base ingredients the same. Line an 8” square tin with greaseproof paper. Put in a little ghee over the paper and spread it with your hands. 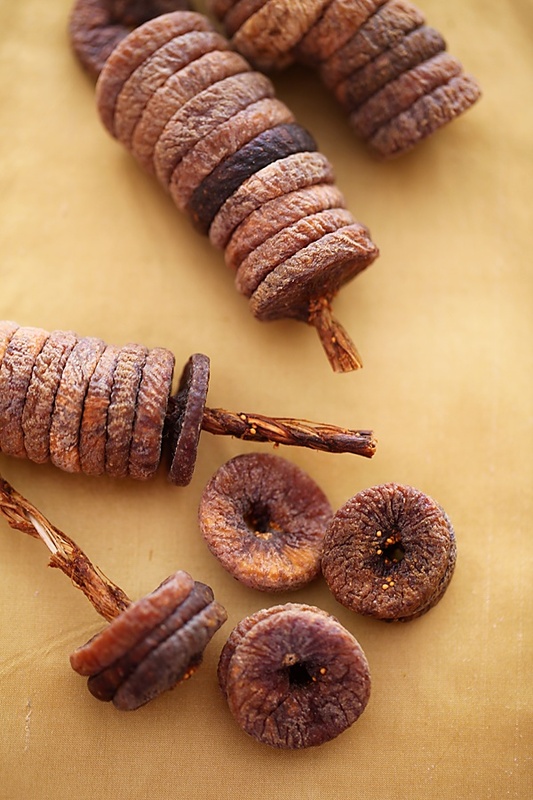 Blanch the figs in hot water for 5 to 6 minutes by placing the figs in a bowl filled with hot water. Make sure that the figs are completely immersed in the water. Drain completely and puree in a blender or food processor. In a wok, over a medium flame, put in the ghee or oil and after the ghee melts lower the heat and add the pureed figs. Cook on low heat for 4 to 5 minutes by stirring continuously. Turn off the heat and when it cools a bit mix in the dates, almonds, pistachios and cashews. Stir in the cardamom powder and mix well with with a spoon or with your hands. Put in this dry fruit mixture into the pan and press with a wooden spoon to make the surface even. Chill in the refrigerator for 10 minutes. Cut into squares or diamonds. Or make into laddus. 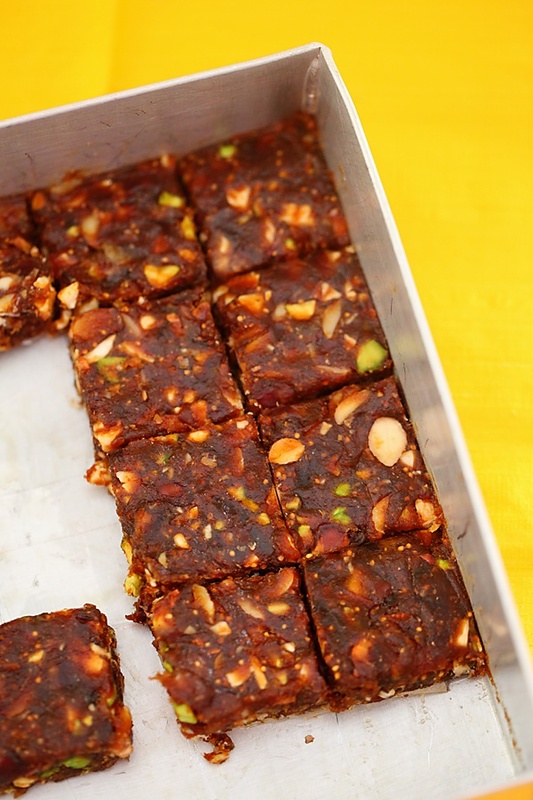 Wow dear reading this recipe itself made my mouth water…..yes as u rightly said most of us prefer ordering sweets from outside rather than making it…..but when its made @ home it really gives a great sense of achievement and satisfaction. Also since this is sugarfree and contains a lot of dryfruits i think i can even eat this in between meals to prevent those hunger pangs and I am sure even my toddler son who loves raisins will like this if i add some of it. Healthy and nutritious too. Also tried ur seven cup burfi this diwali…..it turned out superb. Thank you so much for such wonderful burfi recipes. Lord Krishna Bless you and ur family and a very happy and prosperous diwali to all of u.
Omg, super fantabulous burfis, irresistible and inviting. I am definitely gonna make this awesome sugarfree delight.. 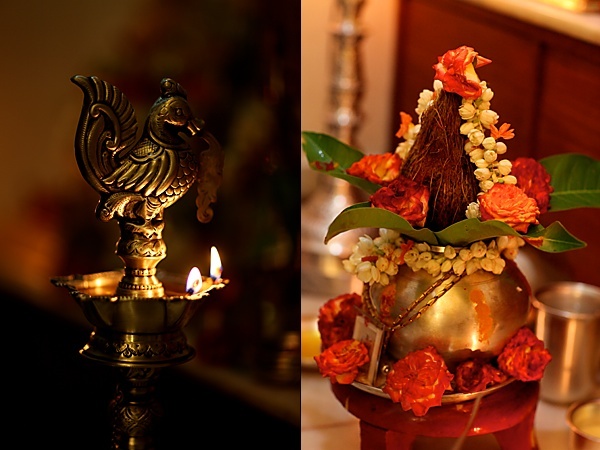 Happy Deepavali to you too..
You echo my thoughts:) Beautiful pictures, the peacock holder is so ethinic! Fab recipe! Thank you everybody for your wishes. This is a very simple and easy to make sweet! Hope you all enjoy it. We are mere 'vessels' who have the responsibility of passing on what we receive to our future generations. Bharat is living in varied time scales with different mind-sets and varying economic levels.The truth is that there is indeed a phenomenal change taking place.But many things are going amiss just as what you have stated. But now even people young as you can see the 'boat being rocked'! I do hope and pray that 'thoughts and thinking' of the likes of you will inspire others to ponder and ruminate over the causes and reasons of societal upheavals metamorphosing the very nature of our Bharat today. Such losses and changes will change the face of MOTHER INDIA- VANDE MAATARAM!!! PS;Your blog is beautiful and the food is indeed DIVINE – just as the title suggests!!! 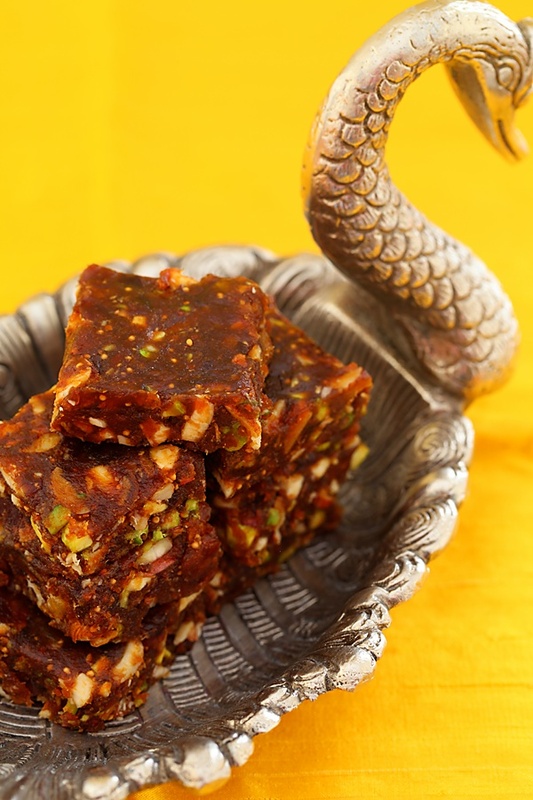 Best sweet to make for Diwali. Love the fact that it is sugar free and lovely pics! Lovely Sweet Treat Anushruti. I'm not really a fan of dry fruits but bookmarking this coz am sure my hubby will enjoy snacking on this…thanks for sharing! Well said anu. The burfi looks very nice and divine. Lovely yet simple burfis Anu. Happy Diwali to your and your family. I make these burfis too…I also add dates as a sweet addition and it acts as a sticky binder for the other ingredients. Vijaya Pant: Thank you for your kind words and for sharing your profound thoughts and insights here. Hope to hear from you again! Panmeiz Cuisine: I'm sure your husband and you will love snacking on this! Gives a fresh burst of energy and satisfies the sweet tooth at the same time. urhegde: Thank you for the prop mother dear! Shoba: Happy Diwali to you too! Loved the texture, colour and taste ! Good snack for kids during exam time. Neela: Great! A snack for exams is a great tip too. to make and yet a healthy desert treat, for kids especially. Vish: I'm very happy to hear from you! It's wonderful that you distributed this burfi for the kids in school! Its delicious, healthy and a great treat! I am so happy to have got you by chance.this recipe is great n looks easy.I will try one by one. I am from mangalore,though brought up in Mumbai n now in shanghai.I have a lot of free time here n will surely try your recipes. Shaila: The prefer the ground powder as the seeds can be quite unpleasant when you get it whole in the mouth. Also, powdering the seeds releases more flavours! This looks like a very healthy recipe!.. I've seen similar recipes where it is instructed to bake this mixture in the oven, how different is that and this? This is a brilliant recipe!!! Thanks a bunch for sharing. G: Great to hear that! can i make this without the figs? do we have to roast the nuts anu? Thank you very much for this recipe. I made it for Diwali and it was superb! Saved me so much hassle of preparing something complicated. Looks wise also this burfi was classy and loved the chewy and crunchy taste. Niki: You can if you want to. I didnt roast my nuts here. Jayashree: Glad to know that you enjoyed this. 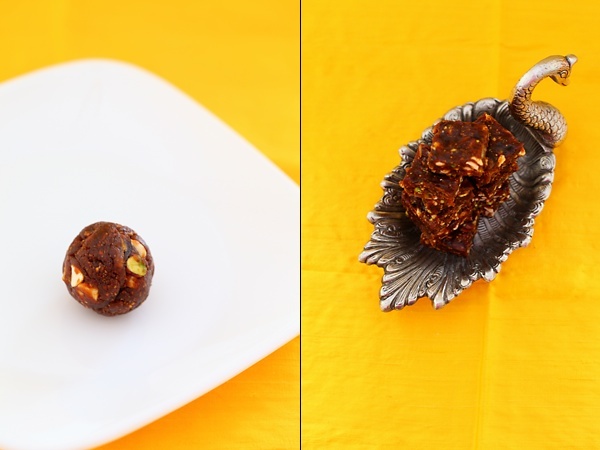 Kavita: Yes you can use only dates and nuts too. Neha- Glad you liked it. Loved your recipe. I had contest and made your recipe and loved it. Very nice article. Your site is heartening. Your awareness of Ayurveda is equally praiseworthy. However I have a couple of suggestions. According to principles of Ayurveda the pots and pans play an equally important role in enhancing or retaining the quality of micronutrients. The usage of glazed pots and pans however attractive is anathema to retaining the goodness of food. Kajal: You are absolutely right! And that is why you will see me not using any non stick pans. All my cooking pots are cast iron or made of natural materials. This looks amazing! thank you for the wonderful recipe. Quick question, how many days can the barfi last? This lasts for weeks if preserved in an air tight container.